Should this ‘Pinko‘ be controversial? AM 570’s Jeff Allan asked to interview someone from WaterlooBikes about winter cycling (should be around 10.30AM December 8). It’s likely a follow up on a Record article by Terry Pender that ran in this weekend’s daily profiling local cyclists who keep pedaling when the snow falls. Terry kindly made mention to WaterlooBikes. As much as I’d like winter cycling to be an extreme sport it’s not. Much of my opinion can be summed up by UrbanCountry’s post who chides us North Americans on our tendency to over-complicate. Is it something seasonal cyclists should consider? Yes, winter cycling is akin to going for a long walk in the cold. For much of the winter, roads are dry. It’s just a bit colder so dress as if you were going for a long walk. Is it dangerous? No more than driving a car or walking in the winter. Depending on the road conditions you may wish to stay away from busy roads or depending on the weather it may be prudent to stay off the roads. Do you need special equipment? 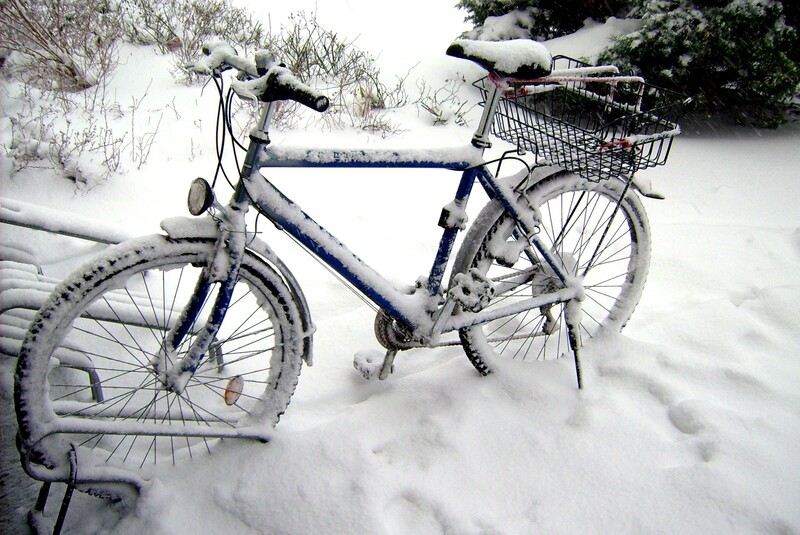 You may want winter tires, a toque, some gloves, good shoes, ensure you’re visible (working headlights and rear tail lights) and ensure you’re bike is properly maintained ….. sounds like driving again. Doesn’t sound too controversial, we’ll leave that to Grapes. No sense being ‘Fordian’, all we want to do is raise awareness that for some there is an alternative to the car. About the danger of winter cycling…Yesterday while out on the roads, for the most part roads were clear or close to being clear. ALL of the sidewalks were covered in one inch of pure ice, so I would consider cycling safer then walking…Just as long as you take your time and don’t take corners fast. As for tires, I wouldn’t say winter tires as much as I would encourage people to get an old mountain bike with at least 2″ wide tires. Doesn’t sound conversational to me. Hey Ryan – The questions in bold were those asked by the Radio Station. I’ve been using the snow and cold weather to ride a little slower. The benefit is that I arrive to work dry and don’t have to change clothes when I arrive at work. I would also say that you probably don’t need to dress as warmly as if walking. I wear a light jacket and a thin touque. My gloves are a different story. Hands get cold fast on a bike. I use to have issues with my hands. Seems to work (so far) as I’m just wearing cheap stretch gloves and haven’t had any serious issues with cold hands. One complication that I recently came up with that I really like is clear lenses for my sunglasses. Keeps the wind from drying out my eyes and protects me somewhat from the snow blowing off car rooftops as they go by. Had the interview, it went well, but streaming of the site is blocked so I have no idea how the larger context came across. I was boringly non-controversial (part of me regrets this). Can’t wait till the podcast is out! I figure if the cars can’t stay in control enough to not maim us, then maybe winter driving should be illegal. You did a good job Graham. Good ambassador. He was trying to get you to go down the path of how difficult it is, but we all know it’s not. I have some wool gloves with leather palms, and that has been fine for my hands. I have a thin tuque that fits under my helmet, and keeps my ears warm. My only concern is footwear – I feel like I shouldn’t have to wear giant boots because I’m not walking in much snow, but any normal shoes seem to get soaked. The cycling booties I’ve seen seem kind of expensive – anyone have any ideas? For me it’s all about socks. For my commute (5k one-way) I’ll use smartwool and use jogging shoes or day hikers. I don’t worry about getting soaked, I keep a pair of shoes at work. I figure skin dries, it’s about the cold and wool in general keeps you warm even if wet. When I’m doing longer distances on my roadbike I’ve got wind-booties for my clipless cycling shoes and if it’s cold and wet I’ll add in the smartwool (generic brands work just as well) socks. An extra pair of shoes at work! Why didn’t I think of that? Thanks Graham. Previous Previous post: Light Rail Transit – A deathtrap for cyclists?